This women’s conference on leadership is for busy professionals who want a quick but power packed session to accelerate themselves in 2018. An article published from Harvard Business Review based on research Korn Ferry conducted with 57 Female CEOS underscores the very premise of We R Artemis’ leadership skills for managers on Courage, Confidence, Risk-Taking and Resiliency. All of our leadership skills development classes and executive coaching training are about making those traits these CEOs say are in short supply, more powerfully present in women managers. This Miami leadership training developed by We R Artemis Leadership Inc., connects professional women directly with proven and effective strategies they need to Rise Above the fray by focusing and maximizing their success in the 30% Zone. Milka is a women’s executive (leadership) coach who works with women professionals and entrepreneurs globally to gain the knowledge and tools they need to succeed as they rise into leadership roles. Start Going After what you Want and Lead like a Heroine and turn Fear into Fuel. Gain insight, motivation and equip yourself with the toolkits and proven practices that will guide you to bring to life your personal and professional aspirations. “I’m not confident I can take on more, when I already feel weighed down and overwhelmed? ….this leadership skills training is for you. Take just One training or take all Four but make a decision before the year is over that puts YOU, your personal needs, at the center. Join us for our new Rise Above Success: A Women’s Leadership Series. It is four dynamic workshops for busy women professionals who want a quick but power-packed leadership development session to accelerate themselves in 2018. This unique program developed by We R Artemis Leadership Inc., connects you directly with proven and effective strategies. This is NOT a women’s empowerment program but a workshop to Learn, Strategize and Commit. This is the type of reflective and action-packed workshop that top executives receive as they move closer to the C-Suite. Grow and Stretch Your Leadership Skills in 4 Easy Sessions. FOUR ACTION PACKED WORKSHOPS FOR PROFESSIONAL WOMEN AND MANAGERS THAT MEET THE LEARNING & DESIGN REQUIREMENTS OF ASSOCIATION FOR TALENT DEVELOPMENT. IT’S ABOUT LEARNING AND MODELING NEW BEHAVIORS AND ABOUT EMPOWERING YOURSELF TO SUCCEED. Gain insight about the behind the scenes reality of HOW top women leaders became courageous, resilient, confident and able to take career propelling risk. Motivate yourself to understand the uniquely different and highly specific career cycles of women, which is very different from that of men. 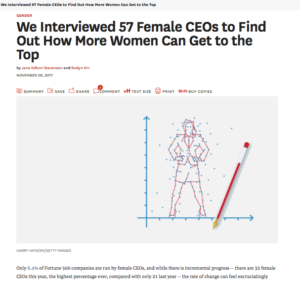 Equip self for success by learning to authentically embody the very traits 57 Female CEOS believe are completely lacking among most women in the workforce. 1. Avoid the Top Mistakes that will derail your career as you transition from one role to the next. 2. Be more proactive and Less Reactive in your professional and personal relationships. 3. Start going after what you want and Stop Settling for what is given to you. I will be interviewing Ebene Naturals about how should found the courage to lead herself and others to launch one of the first natural beauty products to be carried nationally at WholeFoods and Amazon.com. show up for yourself in every situation, even when you don’t feel at your best. speak up impactfuly and worry less about what others are thinking about your delivery. tackle limiting beliefs and self-doubt that minimizes self-belief and self-efficacy. move through difficult professional and personal situations with greater ease. A Miami-based Portrait Photographer, Joe Wesley who has presented his work at Art Basel will be on site to take professional headshots for all participants. You will learn How true self-confidence has nothing to do with a feeling but everything to do with being self-aware, intentional and strategic in all of your choices. Your self-confidence will impact how much money you make, what types of personal and professional relationships you have and your ability to succeed in life. This class is about learning some practices that you can begin to use immediately to combat stressors and negative emotions that diminishes your life-force and self-belief when ignored or dismissed. Through immersive activities and practices, you will become more confident, you will learn how to begin to break negative patterns that are holding you back.